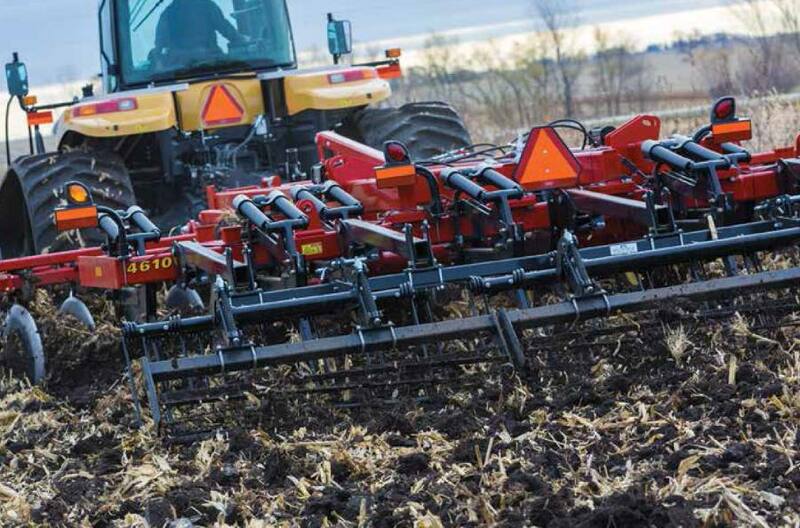 The Sunflower 4511 and 4530 are primary tillage tools built around the performance proven staggered, overlapping front and staggered rear disc gang design. This design, long used in the tandem disc harrows, is field proven to uniformly cut the working width of the tool and leave the field surface smooth and ridge free. They are medium depth tillage tools with working depths up to twelve inches. Rigid Shear Bolt or Auto-Reset Shanks spaced at fifteen inches. The individually mounted front blades are triple compound angled. This patented design is the source of this tool’s aggressive performance in sizing and burying the toughest residue. The chisel shanks are spaced fifteen inches apart and will accommodate a variety of points. The front and rear gangs are hydraulically controlled from the tractor cab and operate independently on parallel linkage. This is the ultimate in deep tillage tool design. Frame: The main frame of the 4511/4530 Series is constructed of 6” x 4” x 3/8” steel tubing and is reinforced in all the high stress areas. Wheel lifts rotate on maintenance-free bearings (UHMW material) and lift tubes are supported by multiple frame members for maximum support. Sunflower pioneered the use of Ultra High Molecular Weight material in the lift system of the SF1433 tandem disc harrow way back in 1994. This material excels in this application because it virtually eliminate friction and wear. Under a microscope it can be seen that the steel tube surface is inlaid with microscopic pores. These pores fill with UHMW material after a few rotations of the lift tube. Once filled the steel surfaces are now coated with UHMW and wear is virtually eliminated. Shanks: The Auto-Reset shank combines shank protection and an automatic reset feature for non-stop operation. The shank provides high trash clearance with a raised pivot point, 30” of under the frame vertical clearance, and a 50 degree point angle. The adjustable point load may be preset to either a high or low setting of 1,400 lbs. or 1,200 lbs. The Auto-Reset shank also features a 13” vertical trip height for protection from obstructions. Individually Mounted Front Blades: Three different angles are combined to create the most aggressive single gang assembly in primary tillage. In this patented equation the gang beam is attached to the frame at twenty-two degrees, the C-Flex bearing arms which hold the blade hubs are formed at eighteen degrees and the blade spindles are set at eight degrees above level. The spindle angle is to counter the heavy draft of the soil and necessary to maintain the position of the blade at the correct angle to effectively size residue and invert soil. Each blade assembly of the front gang is equipped with a two piece shield. The shields control the flow of material between the blades and through the gang to avoid plugging. Rear Gang Assembly: All gangs are mounted to the main frame with parallel linkages to maintain the blade angle throughout the gang’s range of depth adjustment. The rear gangs are assembled on heavy 1-3/4” alloy steel arbor bolts. Spring steel washer and gang nuts on each end keep the assemblies tight. The staggered and overlapping gang design of the 4500 Series ensures uniform tillage across the width of the tool and level output. The rear gangs of the larger rigid models fold hydraulically producing a narrow transport. 3 Bar Coil Tine Harrows: These coil tines level the soil and evenly distribute crop residue. The attachment’s spring down pressure and tine angles are easily adjustable. The coil tines are 5/8 inches in diameter and 30 inches long to allow ample room to clear heavy residue.